Leeds Trinity Freshers week is run by your Students' Union. Designed to show you round the local area, save you money and help you make loads of new friends. 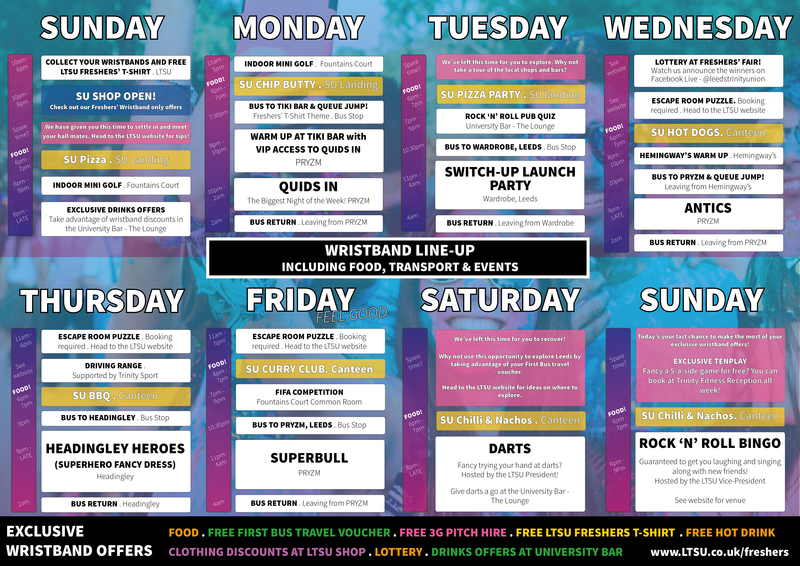 The wristband is an all inclusive offer for all paid activities during freshers week. It also gives you priority over limited stock or event entry. Students asked us to save them money, help them make friends and hold lots of events. Our wristband has all these aims. Leeds Trinity Students' Union weekly guide gives you the entire freshers program in one place. It includes both paid and free events and activities. Even more ways to make friends and make the most of your Fresher's week.